"JWA's Rising Voices Fellowship has played a tremendous role in shaping the Jewish feminist lens through which I now view the world. 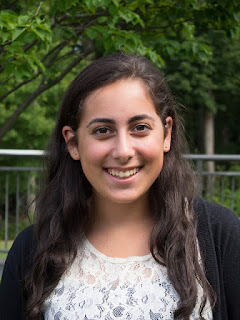 Rising Voices has taught me an immense amount, not just about feminism and Judaism, but about leadership and what it means to use writing as a tool for change. The Rising Voices empowered cohort is truly like no other. We represent the full spectrum of the Jewish community; from modern Orthodox, to the classically Reform. Some of us go to shul, some to temple, some to synagogue, but we all go to rallies for income equality. Some of us write about the pop stars and fashion; others write about Emma Goldman and dreams of becoming Orthodox rabbis. But all of us have one thing in common: we are feminists. I am a member of an extraordinary and powerful group of young women, we are intellectual and passionate--and yes, we are feminists. Hearing one another's stories, I now understand how important it is to really own this badge of honor. To name what I have always known myself to be: a Jewish feminist. For me and so many others, feminism and Judaism have never gone exactly hand in hand. While this is something I have tried to explore independently, the process of discussing these matters with my Rising Voices peers adds a new layer of depth. Whether in monthly webinars with the entire group, or simply texting my peer editor in Massachusetts, I feel connected to young women across the country who share my passions. The Rising Voices Fellowship bridges geographical gaps and provides an important venue for the developing young female voice. I've had the awesome privilege of working side by side with my amazing, passionate RVF peers, digging deep and writing about the issues we care so deeply about--feminism, Judaism and finding our place in both of these worlds. Rising Voices Fellowship is helping each of us to make a difference in so many important ways. We are a group of young women who are on the cusp of big transitions. We are en route to college, imagining our next steps in the world. Rising Voices Fellowship helps us to explore issues about our own identities as Jews and as women; providing us with the tools we will need to grow as feminists and as activists. The voices of teenage girls, and more specifically those of Jewish teens, are nearly invisible from the public's view. By raising our empowered teenage voices, we tackle issues from sexism to ageism. Rising Voices allows for twelve truly unique young women from all over the country to think critically about our lives, our country and our culture. The Fellowship allows for each of us to learn from one another. Although this satisfaction is certainly a remarkable result, the means for making a difference is not in the individual process of writing, but in putting our thoughts and opinions out into the world; through blogging."